Brought to you in collaboration with Bedford Parks & Recreation Department, this class is open to anyone over the age of 18. Designed for all ages and all levels of abilities, this class is perfect for anyone looking to enter or re-enter exercise, and progress, advance or improve function in a safe manner under the guidance of a physical therapist. All participants will undergo an assessment by a therapist certified in Applied Functional Science to establish your individual parameters for participation. 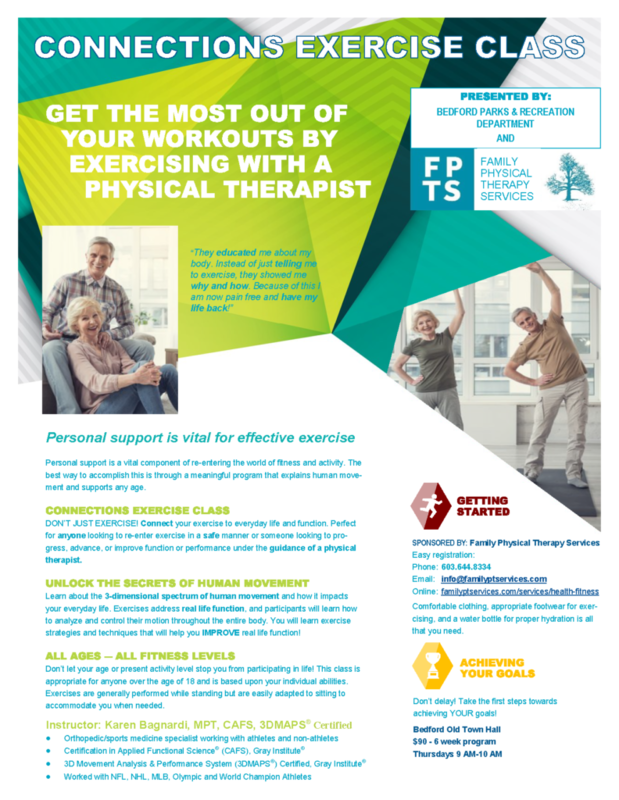 To register CLICK ON THIS LINK or call: 603.644.8334 or email: info@familyptservices.com and reference the CONNECTIONS EXERCISE CLASS. EASY and SECURE ONLINE PAYMENT Just enter the program fee of $90 for CONNECTIONS EXERCISE, $100 for the OPTIONAL 3DMAPS® Assessment, or $190 for CONNECTIONS EXERCISE-COMPREHENSIVE which includes both the assessment and the group exercise class.